Today's Draw: Seven of Wands from the Art of Life tarot. What does freedom mean to you? If you're American, what freedoms will you be honoring tomorrow? What freedoms do you value the most? 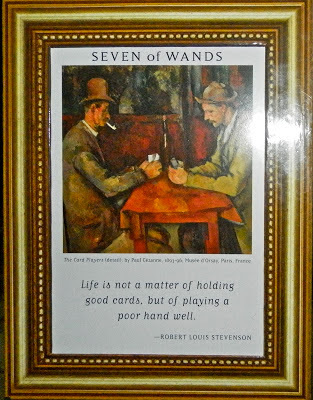 "Life not a matter of holding good cards, but of playing a poor hand well." Ironically, the cost of "freedom" in any society is limitation and compromise. To live in this "land of the free", we might have government peeking into our Facebook posts. We might have to pay taxes. We might have to live by laws and limitations. And in exchange for all that, we can mock our president, live where we want, work where we want, and play any bad cards dealt to us any way we want...within the confines of the law. The beautiful thing about our country is the sheer number of people who play a poor hand well here...who live quite well within the bounds of our freedoms. But political and personal freedoms are just part of the freedoms we enjoy. We also have a spiritual freedom that helps us play any hand well. And this is choice we make within ourselves. To a large degree, it's beyond any limitation imposed by outside forces. Included in this would be freedom of thought—we may or may not live somewhere those thoughts can be voiced, but nothing can keep us from thinking them. Our spiritual beliefs and devotion are also free. You may not be able to express them openly, but nobody can keep you from having them. While the freedom to express those things may be bound by politics and geography, limiting some and liberating others, deep within every living soul is an inherent freedom to align with something greater than ourselves. Or not. While we may not like the choices before us, we are also all given the freedom to choose. And every single one of us will be dealt a bad hand now and again in life, but guess what? We all have the freedom to decide how or if it's going to defeat us or make us stronger. Tomorrow our nation will celebrate the 237th anniversary of our freedom form those meanies, the Brits. :) And this year we also celebrate the 150th anniversary of freedom from the oppression we placed on ourselves when we decided freedom had a skin color. But we might also celebrate the ancient anniversary of man's freedom to rise above whatever cards are dealt and find and comfort within. That's the one freedom that truly is free.